Cost-effective, safe and flexible collaborative robots, or cobots, are making automation easier than ever, even for small and mid-sized companies. But while cobots can take on an amazing range of operations, some jobs make more sense to automate than others. That’s especially true if you’re just getting started. 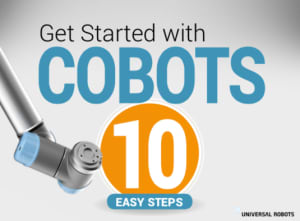 But how do you determine if cobots will be useful for your operation and exactly what can these machines do? This white paper can help you answer those questions and more. What you can automate with cobots and what it means for a robot to be “collaborative”. What environments are best suited to host cobots. Whether or not you should worry about programming a cobot. Complete the form on this page to download your free white paper. Your download is sponsored by Universal Robots.